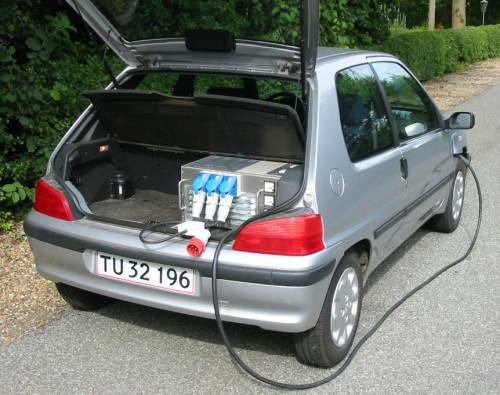 We have a Peugeot 106 electric for our private use and have used it for 3½ years. In this period it has driven 64.000 km (40.000 miles). Through this spring I made a new improved portable fast charger, which can be in the car boot during a voyage. The new charger allows the car to be charged by almost the maximum output from a 3 phase 230/400V 16A socket. The electric car with the fast charger in the boot. With more than 3 fold faster charging capacity it was interesting to try out how the car would perform in long distance travelling. We should to France in the summer holydays and decided to drive the 1.100-1.200 km down there in the electric car. As the boot was full of the charger and cables, the capacity of the car was limited to only two persons. It fell to the advantages of my 12 years old daughter, who became my co-driver. We did not make much upfront tour planning except from a couple of arranged visits. To be able to have access to the 3 phase power sockets we intended to drive on workdays and in the day time. From experience we know they are difficulty to get access to in the evening and weekends. We had preestimated the car to be able to do 400 km in 12 hours, so the trip was set to be made in 3 days. We started out from near Ringkoebing on the west side of Jutland Monday morning at 7.25 in the morning. At 9.00 we arrived in a village south of Ribe with 108 km on the counter. We had to ask 3 places and spent 20 minutes in finding the 3 phase power. We got power at a MC shop, where we were kindly received with coffee. At 11.00 the car had a full charge. We gave them 5 euros for the power and drove to Husum in Germany, where we arrived at 12.40 after 101 km. Here we got power at Vestas Wind Systems, who make wind turbines. 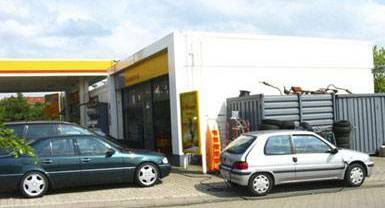 At 14.30 we left Husum and headed for Itzehoe, where we stopped at a Shell station at 16.05 and 94 km. We got power from a plug in their Autoteknik room till 17.30 for the cost of 5 euros. Typical charging situation at a service station. At 18.40 and 54 km we arrived at our friends in Hamburg. The 357 km to Hamburg was done in 11h 15 min. which make an average speed of 31.7 km/h. (19,8 mph). In Hamburg we spend the evening with our friends on the banks of the river Elbe. Here we watch the cargo ships sailing in and out of Hamburg. We left Hamburg in the morning at 7.00 with a complete over night charge on the batteries. During day charging we do not make the top charging of the batteries! We drove with the Motorway under the Elbe till 30 km south of Hamburg. Here we shifted to the main road to Verden. Just after Verden we stopped at a car repair shop at 8.55 and 108 km. Here we charged till 10.35 before leaving and heading for Minden. At Minden we had still some power left in the batteries and decided to continue further on. Here we went on the motorway to skip some towns. The motorway was full of traffic and had a steep hill, where we couldn't keep the speed up. The trucks were not pleased with our uphill performance so we drove out on the hard shoulder, where we were climbing the hill with 40 km/h. We left the motorway to find power in Bad Salzufler east for Herford. Here we stopped at an ARAL filling station at 12.40 and 115 km. Again we got power from a socket in their Auto-Teknik room. A person selling Russian motorcycles had rented the room and showed us some old timer bikes, i.e. a Russian replica of the German BMW sidecar motorcycles as the Germans used in the Second World War and a Diesel Enfield, which can make 100 km on 1½ litre. At 14.20 we left Bad Salzufler and drove to Hoppecke Accumulatorenwerke near Brilon. Again we did some motorway and this time it was ok, as there were no hills on this part. Then we could just keep up with the speed of the trucks. After the motorway we had to climb some hills, where the speed came down to 40 km/h. We arrived at Hoppecke at 16.00 and 97 km. Here we were kindly received and had time to see battery technology and discuss features for the battery electrical vehicle. 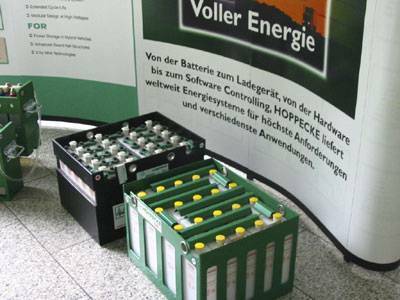 After 3 hours at Hoppecke we went on with full charged batteries and "brains" to some as far south as possible before night. We drove cross country through small villages and single lane roads. Some roads were so steep that we could only do 30 km/h uphill. Downhill we recaptured some energy from the regenerative breaking. We drove 10 km downhill without using power. Some of the houses in the villages were extremely beautiful. Such houses cannot be seen from the motorway! The beautiful town Holzhausen with ancient painted houses. 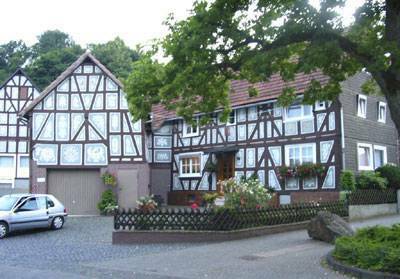 At 21.40 and 110 km we arrived in Gladenbach west from Marburg. In Gladenbach we stayed over the night charging from a 230 V socket at the parking of the hotel. The day "trip" made 430 km in 14 h 40 minutes. This is an average of 29,3 km/h. If the 1h10 min, where the car was not driving nor charging, is taken out of the travel time, the 430 km was done in 13½ h. This is an average of 31,8 km/h (19,9 mph). We left Gladenbach at 7.45 heading for Frankfurt. 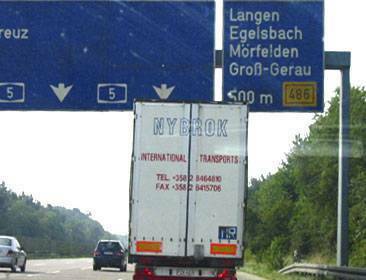 Again we decided to do some motorway and follow the trucks, so we did not disturb the traffic flow. We stayed behind a large trucks and benefited the truck was breaking the wind. This made it possible to reach Darmstadt at 9.30, where I have a business partner. We spent some time seeing the factory and at 11.45 the car was fully charged. Then we headed for French border west from Karlsruhe. Once again we did motorway and arrived in Kandel near the French border at 13.45 and 120 km. Here we powered the car at an ARAL service station and left before the charging was complete for France at 15.20. The traffic to Strasbourg was light so we could cruse in our own speed of 80 km/h. In Strasbourg the traffic was dense and we had to drive at 90 km/h in 3 lanes full of cars. 20 km after Strasbourg we arrived at our target in Molsheim at my parents in law. We arrived at 16.45 and 101 km with almost empty batteries. The day trip was 341 km in 9 hours. This make an average of 37,9 km/h and without the ½ h waiting time before charging in Darmstadt the average travel speed is 40,1 km/h (25 mph). The Performance of the car improved during the trip. It reacts like a human body, which become better performance the more exercise it do. I will say the car has improved its performance with 20% during the 3 days intensive use. The half the improvement is the probably due to increase in outdoor temperature and the other half is due to intensive charge/discharge cycling of the batteries. The battery temperature was on the 3rd. day between 32 and 39C! During the trip the power has been paid at the service stations with 5 Euros pr charge. 6 times the power was paid bringing the power cost to 30 euros. The trip from home in Denmark to Molsheim in France was 1.128 km and the power cost during the trip was 30 Euros (2,66 Euros /100 km.) A petrol version of the car would have done it for 70 Euros! Estimated the car has used 190 kWh to do 1128 km (16,8 kWh/100 km): This energy is equal to the combustible energy in 2,0 litre gasoline or 1,78 litre gas oil per 100 km! - Yes it is possible to drive long distances in a battery electric vehicle. if it has 3 phase power for charging. This should be an integrated part of the car instead of being an extra unit taking space in the boot. own charger the charging time would have been app. 5 h/charge! are locked in outside work hours. phase charging makes app. 15 km/h! inferior. Just 5 km/h more would make a difference. for 100 km in summer and 80 km in winter. both hilly terrain and on motorways. PS. Thanks to the people, who helped us with power. The return trip will be made over 4 days from July 16. to 19., so more time is free for sightseeing.